Hirebridge helps you attract, engage, evaluate and hire the best talent. Simple. Hirebridge is an easy-to-use, affordable applicant tracking system that empowers small and mid-sized organizations to optimize talent acquisition. We understand that every organization is unique, which is why we provide a range of cloud-based solutions to meet their unique needs. No matter the industry or the size of your organization, Hirebridge has a solution to meet your specific needs and can help you reduce the time and cost to hire. Hirebridge provides an efficient way of organizing all of your applicant data, including applications, assessments, screenings questions, notes, emails and activity history, into a single candidate record that can be viewed and shared by Recruiters and Hiring Managers anytime. Every activity taken on a candidate record is recorded, keeping your team on track and accountable as candidates are managed through your process from application to hire. 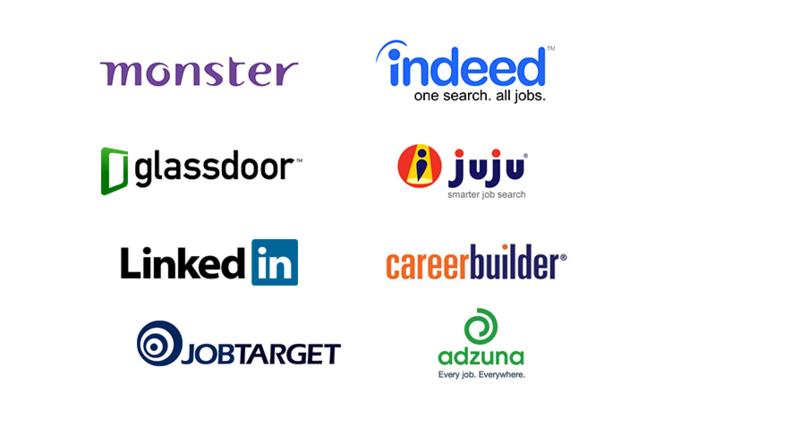 Extend the marketing of open job postings beyond your website to the top vertical job search sites, paid job boards, niche industry sites and just about any site that accepts job postings. Almost 90 percent of job seekers surveyed plan on using their mobile device for to search for jobs in the coming year, according to a recent survey conducted by Glassdoor. 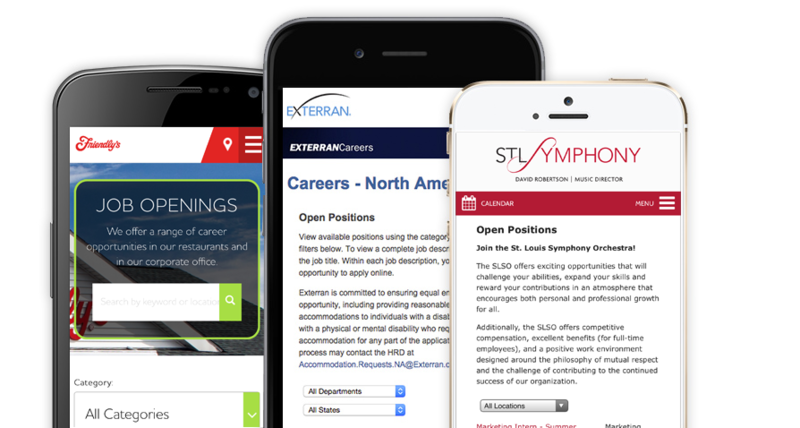 If your apply process isn't mobile optimized, your can be certain the best candidates will likely move on. Serving the needs of mobile job seekers is essential in highlighting your employment brand. Hirebridge has designed a mobile-first, responsive job application process that adapts to all devices, so it looks great and works great on a computer scren, tablet, and any smartphone or mobile device. 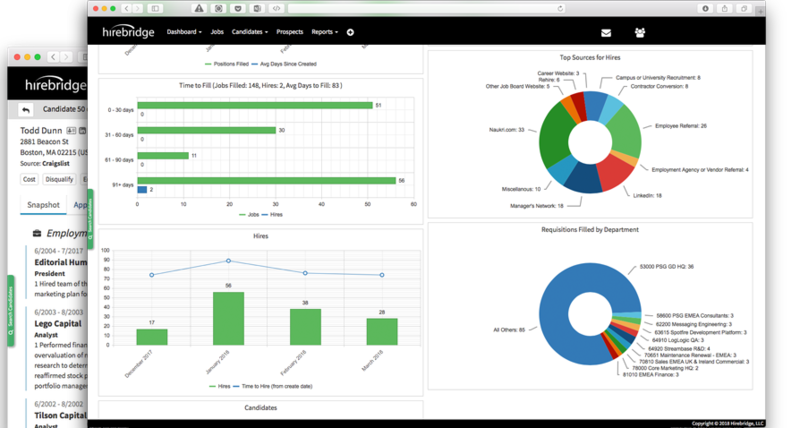 Gain complete visibility and insight into your recruitment process. 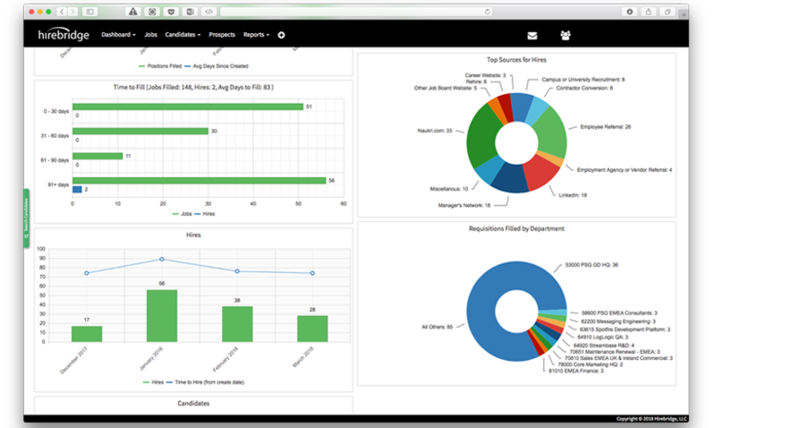 Hirebridge includes comprehensive reporting tools enabling you to pull data in real time. Open position reports, time-to-hire, time-to-fill, traffic trending, candidate sourcing, EEO and OFCCP applicant flow logs are just some of the built-in reports provided in Hirebridge. Benefit from extensive metrics reporting which help identify trends, highlight the successful parts of your process, and identifying potential issues and bottlenecks, all helping to align recruitment activities with your organizations overall strategic goals. Seamlessly integrate an attractive and interactive careers section into your existing website. Jobs are automatically updated without IT or webmaster intervention. 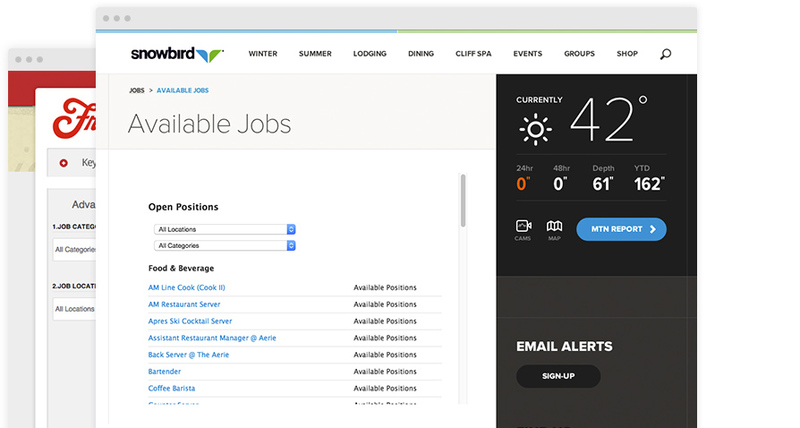 Visitors can search for and apply to jobs, upload resumes in a variety of formats, and forward job openings via email. Store frequently used documents for easy retrieval in a general library, or keep a dedicated repository of documents for each candidate. Candidates can manage their profiles online, update existing applications, and easily apply to new job opeinings using their stored data. Get to your short-list faster with position-specific questions with scoring & utilize automatic disqualifiers to determine the most viable candidates. Designate specific access levels and features sets for each group. Administrators can grant users various degrees of access, giving control of tasks performed throughout the system. Specify which job postings are posted to the company’s intranet website and are restricted from being posted to the public. Manage employee referral programs directly from Hirebridge. Grant permission to preferred agencies or vendors to submit candidates into your system. Create, standardize and record specific steps (can be specified by job) that recruiters & managers have to take in order to move candidates through the recruitment process. Recruiters and hiring managers can connect & share their calendars, schedule interviews and send out invitations complete with candidate resumes, details and interview guides / feedback requests. Create reusable job requisition and email templates for a more consistent message that eliminates redundant data entry. Hirebridge helps you automate distributing your jobs to niche sites and social media sites such as Twitter & Facebook at no additional charge. Interactive data grids make it easy to filter down and segment out your data in any candidate or job requisition data grid. Powerful, Boolean-compliant keyword searches can be run to help pinpoint the most viable candidates quickly and easily. Automatically collect demographic information from every candidate during application process, then quickly generate reports & download your data for offline processing. Generate real-time, pre-defined and custom reports on virtually every action and interaction contained in your Hirebridge platform. Also includes poweful source reporting and analysis tools. Provide restricted access to Hiring Mangers to view candidate records, update status & stages, provide feedback, disposition and start job reqs. Hirebridge Recruiter automatically submits your published job postings to the top job search sites including Indeed.com, SimplyHired, Juju, Glassdoor & Google. Also includes a turn-key Facebook app + direct posting to LinkedIn.